1. "For he&apos;s a jolly good Fela!" proclaims an email I received from Hot Tix. Love it. It&apos;s at the Oriental Theater right now until April 15. 2. Coming up at UP (will that ever get old? We&apos;re pun-heavy today. ): Weekends are devoted to Robert Kelly, Gary Owen, Tony Rock and Kumail Nanjiani for April. 3. Tony Hernandez, the creator of Cascabel, seems to have injured himself multiple times - and alsogotten a response to a snarky tweet directed at TimeOut&apos;s review of the production from Mike Daisey himself -- in the span of a few days. Worlds colliding! 4. Did you miss the full hour of performance-related talk on 848 this morning? It&apos;s all online. 5. 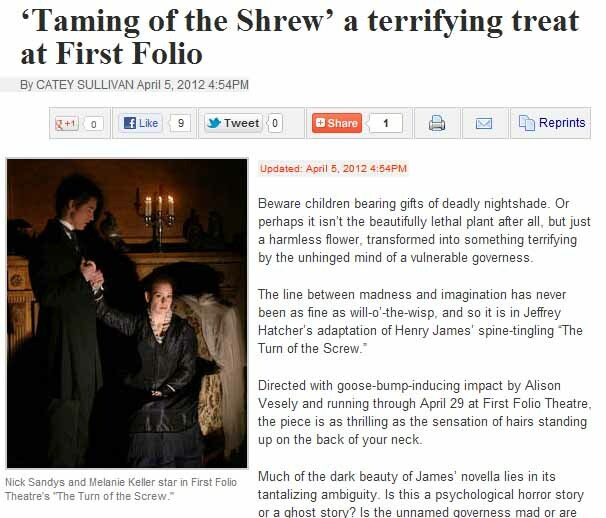 Turn of the Screw is at First Folio and it is NOT my favorite Shakespeare play, despite what this headline says in the Sun-Times.